A motorcycle and car were involved in a collision Monday morning in Kent. The incident occurred near Southeast 208th Street and 108th Avenue Southeast around 6:10 a.m. The motorcyclist suffered non-life-threatening injuries and was transported to the hospital. A preliminary police investigation found that the car pulled out of a gas station in front of the motorcycle. The motorcyclist was not able to stop in time and collided with the car. Police issued the driver of the car a citation. Motorcyclists lack any sort of surrounding protective structure on their vehicles, making them more likely to suffer severe or fatal injuries when they are involved in a collision. Unsafe lane changes: If a motorist fails to check their blind spots before moving lanes, they risk colliding with a motorcyclist. Car doors: A parked car on the side of the road may be dangerous for a motorcyclist. Doors opening suddenly may hit an unsuspecting motorcycle. Speeding: A leading cause of all types of car accidents, speeding reduces a driver’s chance of seeing and reacting to other drivers in time to prevent a collision. Higher speeds = greater damage. Driving under the influence: Driving while impaired by drugs or alcohol greatly diminishes a driver’s ability to safely operate a motorcycle. Lane splitting: Driving between two lanes of traffic is called “lane splitting.” Lane splitting is illegal in Washington state. Sudden stops: Following too closely increases the chances to rear-ending another vehicle, causing serious injury or death. Inexperienced drivers: Inexperienced drivers are more likely to make unsafe maneuvers on the road that could compromise the safety of other motorists. Left turn accidents: Right of way errors or misjudging distance while making a left turn are common causes of injury and death to motorcycle riders. Dangerous road conditions: Any type of road debris or unsafe road condition (crumbling pavement, pothole, etc.) is a risk to motorcyclists. 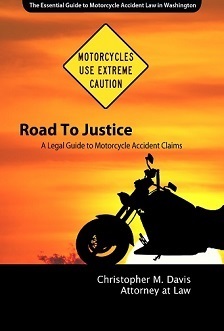 Attorney Chris Davis and the motorcycle accident attorneys at Davis Law Group, P.S., can provide comprehensive legal advice and guidance to motorcycle accident victims in Washington state. If you have been in a motorcycle accident, then you need to speak with a personal injury attorney. Please don’t hesitate to contact us. Call (206) 727-4000, use the chat feature below or fill out the form on this page.